This powerful, far-reaching 4-night personal strategy retreat with Narrative Strategist Julie Hosler is designed to help creative visionaries of all kinds kickstart their next chapter, whether you’re looking for a personal, career-led or business reboot or life transformation. 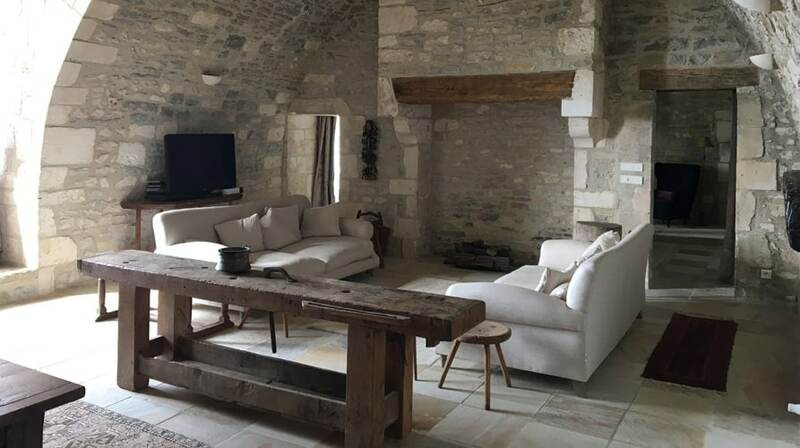 Held at a simply gorgeous private chateau in the village of Chateau de Mailly in Burgundy, it includes one-to-one sessions and daily workshops with Julie, therapeutic massage, delectable chef-cooked meals with local wines and take-home tools to help you map your future success, including a virtual post-retreat follow up strategy session. 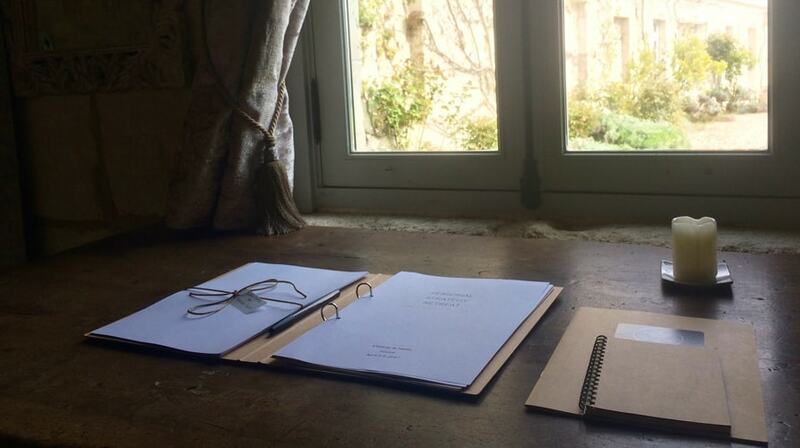 Expect to leave the chateau inspired, focused and ready to take on the world. Julie is a witty, warm guide who has a way of identifying the unique needs of her guests and reflecting them in her curated content. Her workshops are both cognitively stimulating and artistically inspiring, and special touches like customized binders filled with informative and interesting content, the smart notebooks she gives you to write in and the fragrant Diptyque candles she burns in every room make you feel stylishly cared for. 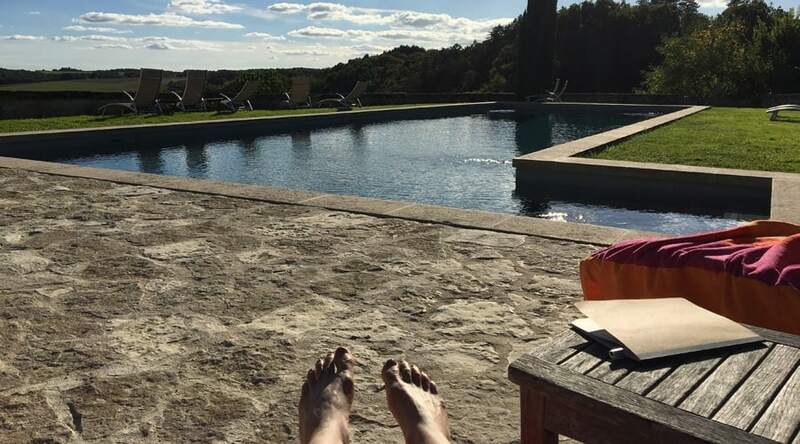 The outdoor cliff top pool is heated and long enough at 18 metres to enjoy a rigorous swim at sunrise or sunset, but depending on the Burgundy weather it can be rather chilly getting in and out. Luckily large bathrobes are provided for your use. You can expect a carefully curated programme of morning rituals, group workshops, solo activities and downtime – not forgetting the insanely good gourmet meals. ‘Personal Strategy’ looks at how you get from where you are now to where you want to be. It’s a bit like life coaching, except your coach shares clever stories and creative techniques and is a strategist who gets into the ring with you rather than just direct from the sidelines. 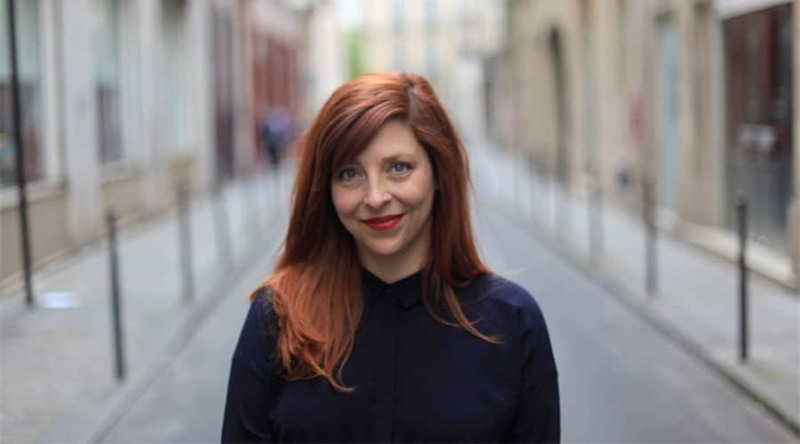 A clearly intelligent and well read American now living in Paris who also trained with the International Coaching Academy, Julie Hosler worked on client campaigns like Apple and Cartier before moving on to strategising the lives of CEOs and entrepreneurs and is a marvellous person to have inside your ring. 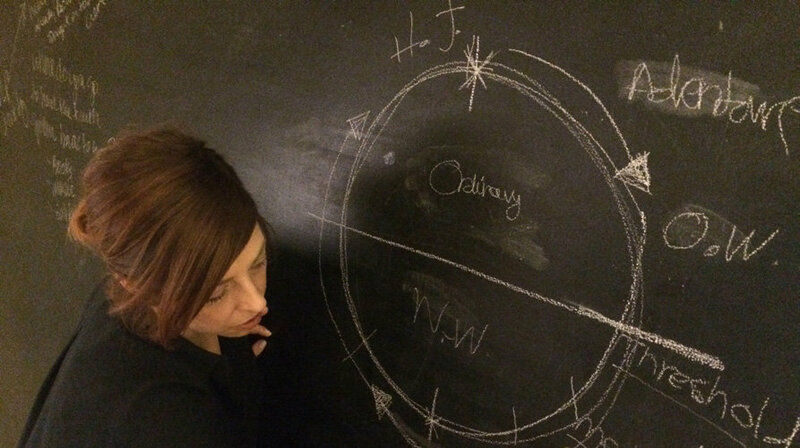 The retreats pivot around three-hour-long group workshops each morning which start at the civilised time of 10 am. In these Julie introduces narrative strategy concepts, shares stories that provide inspiring context and sets workshop activities to make the experience personal and powerful for each individual. The retreat’s key focus is – as the author of your story, how do you want the next chapter of it to go? The afternoons are used for solo exploration, and there are evening apéritif activities to bring the day’s theme full circle. Expect to laugh and want to fill up on stories. No one is required to share anything personal, although by the last day, you’re likely to have already offered it up enthusiastically. The retreat also includes one private strategy session with Julie to consider alternative perspectives and explore where loftier ideas are lurking. You’ll take away a retreat binder filled with informative and inspiring content, and a virtual follow up session 30 days later with Julie is included in the price to build actionable momentum for the road ahead. You’ll feel the benefits long after you’ve finished your retreat. Julie sets contemplative practices for you during the retreat to clear your mind so it can make room for inspiring concepts, and this includes a daily morning ritual. You’re asked to write three ‘Morning Pages’ on waking – an effective ‘brain dump’ technique devised by Julia Cameron in her book The Artists Way that clears the mind of clutter so it can be used more creatively. After breakfast, you then burn the pages in a giant hanging fire-pit at the cliff edge, which is hugely satisfying. Afternoons are free for contemplative solo exploration, and Julie sets practical and interpretive exercises to help you deepen your own self-inquiry based on each day’s morning workshop theme. You might be asked to read, look at or listen to things, to make notes on something personal, to write a letter or imagine a future. 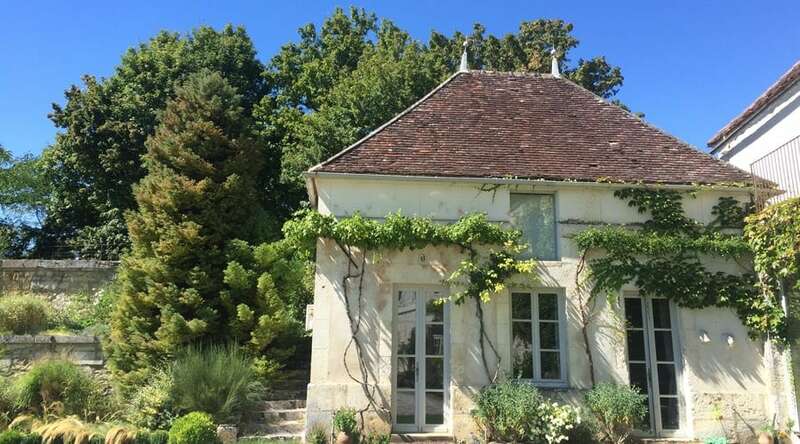 If you feel the urge to move, a marvellous way to think through things is to simply walk in the inspiring surrounding area, and a steep stair-lined path down the cliff’s edge from the chateau will take you to the village below where the Canal Nivernais and Yonne River converge. Explore the tranquil little town, or take one of the good biking/running/walking paths along the canal in either direction (the chateau has bikes you can use). Afternoons are an important time to sink away and absorb the retreat’s content, inspiration and magic. Swim in the cliff edge pool, just to relax, or to pound out your thoughts with rigorous laps. Day dream in one of the tree-garden swings, watch an intentionally selected film in the luxurious media room, or cosy up infront of one of the open fires and enjoy the fragrance of the Diptyque candles that Julie burns in every room. One relaxing massage session is included with a local therapist during the retreat, which you’ll have in a private room on the upper floor of the 19th Century House. Bedrooms: Individually decorated and lovely bedrooms are set in three different sets of buildings. Some rooms have showers, some have baths, some have both – ask ahead if whichever you get is important to you. All bathrooms include a supply of Amber Spa toiletries. 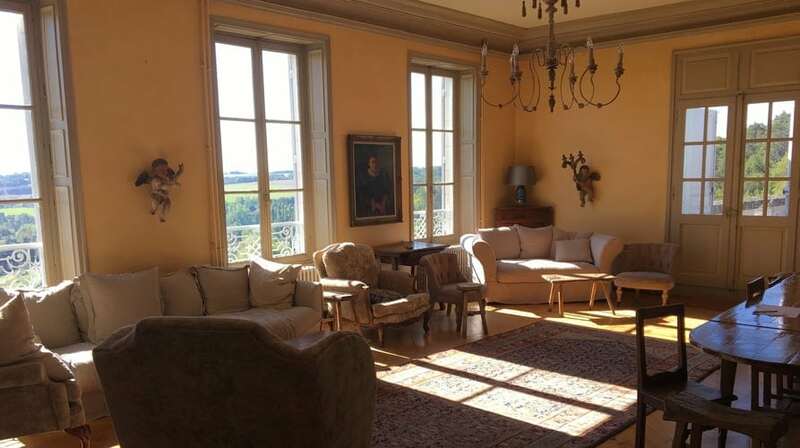 The 19th Century House: Built in 1848, this elegant house is nestled into the cliff’s edge with panoramic countryside views overlooking the waterways and the village below. 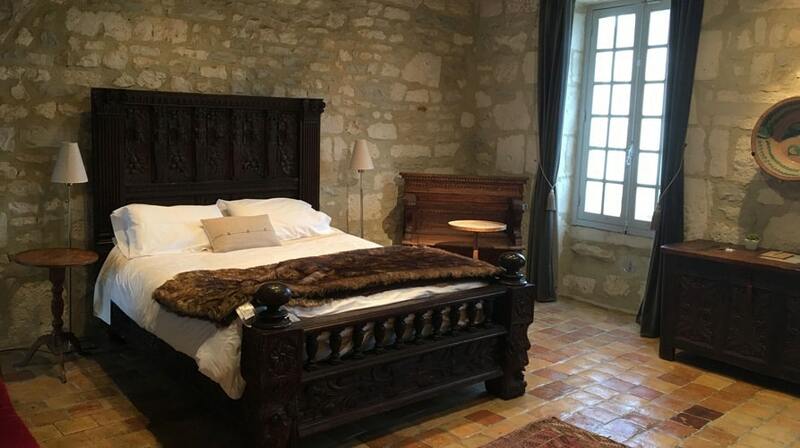 The seven bedrooms here are divided into two wings and have have some of the more expansive views, especially corner room 12, which has views of the chateau grounds on one side and the Burgundian countryside on the other. 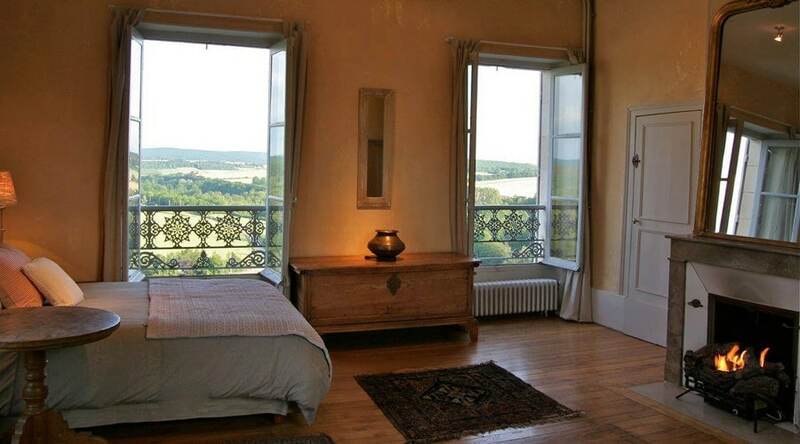 The south wing, overlooking the valley, has a two-room suite and a double room, both with magnificent views. The east wing, overlooking the courtyard, has four bedrooms, three with en-suite bathrooms, and one with a bathroom accessed in the hall. The Commons: Originally the stables, with the servants’ quarters above, the fully restored and air conditioned Commons has three bedrooms on the floor above the magnificent Medieval dining-room, one a massive suite that’s ideal for sharing with a friend. Each has exposed stone walls, open fireplaces, and private bathrooms. The Pavilions: Built into the fortification walls at the rear end of the courtyard, and flanking the terraced rose garden on either side, the two pavilions are like two individual private houses, and look out over the central courtyard and the valley in the distance. If you pay your retreat fee in full at least 4 months in advance you can enjoy early bird pricing (up to 300€). There’s the option of sharing the larger suites – ask ahead. Bring your swimsuit so you can enjoy the cliff’s edge pool. There is parking on the chateau grounds if you choose to drive here. Spring is a great time to kick start a new chapter when you can watch the trees, flowers, and gardens come alive as you yourself change and grow. The temperature can fluctuate, from cold to sunbathingly warm depending on Mother Nature’s mood. In Autumn, the countryside’s show-stopping autumnal hues can be an inspiring backdrop for your own ongoing transformation. It’s not uncommon for Indian Summer to grace the chateau with warm summertime temperatures, or you can enjoy crisp, often still sunny days. 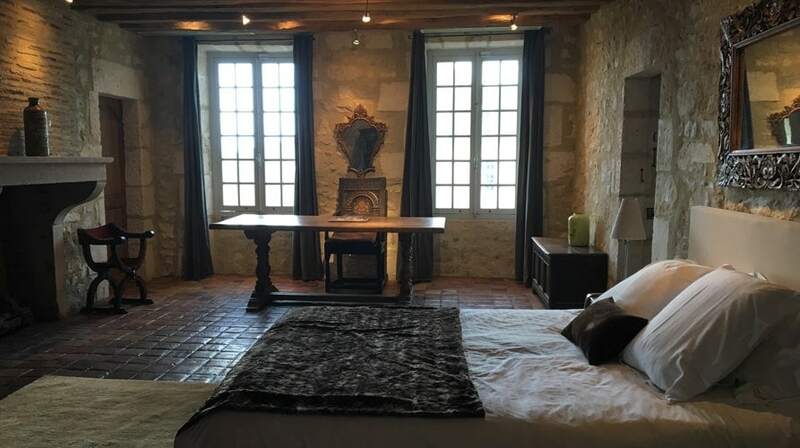 The Caves: Julie’s one-to-one personal strategy sessions take place in The ‘Caves’, the original rooms of the 13th century chateau, with marvellous exposed stonework, open fireplaces, oversized windows and wide views of the valley below. You can’t help but fill up with inspiration and enthusiasm after each session after being in here. 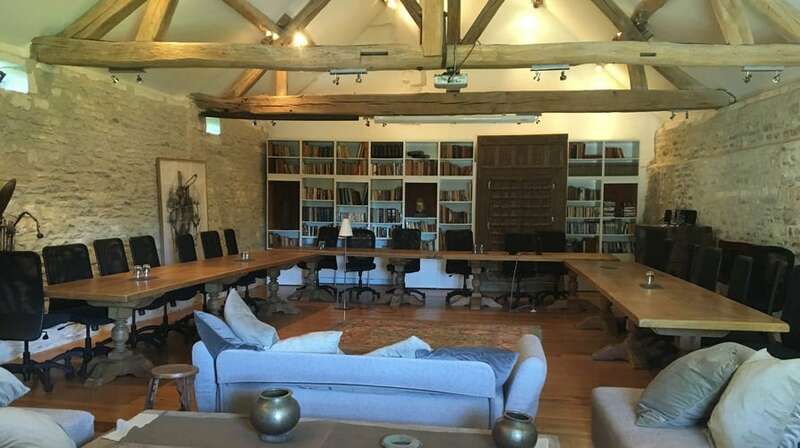 Workshop spaces: Morning workshops and afternoon films take place in either The Commons’ Media room, which has plenty of comfy sofas for settling in or conference style seating for writing, or in the elegant 19th Century House sitting room, which has comfortable sofas and chairs, an open fireplace, views of the countryside below and glass doors leading to a spacious back terrace. The grounds: Wandering the chateau’s flower-filled, well kept grounds is a pleasure in itself. 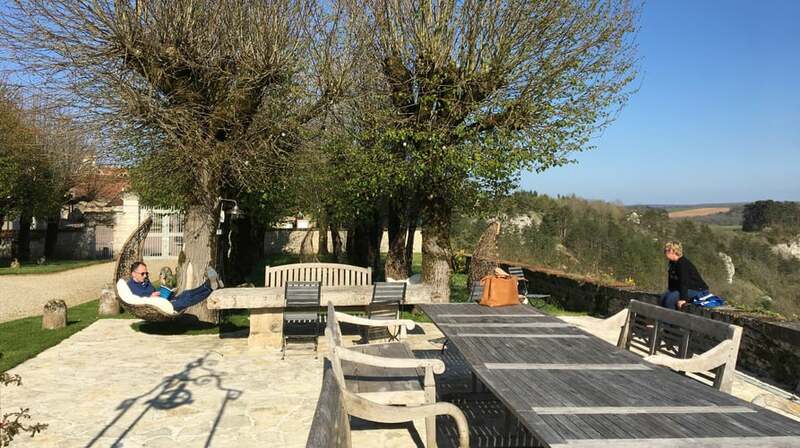 There’s a large central courtyard, a tree garden with hanging basket swings, a rooftop potager, a poolside garden and stone terraces looking to the east and southwest over the expansive Burgundian countryside. The swimming pool: Built into a jutting promontory on the cliff’s edge, the 18 meter by 6 metre pool, is kept heated, in season, to 29° Celsius. There are plenty of lounging spots around the pool and in the grassed garden surrounding it. Be prepared to be awestruck by the morning fog and evening sunsets. The Bourgogne wine and food are cooked and served here by chef Ollie Timberlake’s culinary wizardry reminds you that you are in one of the best culinary regions in the world. 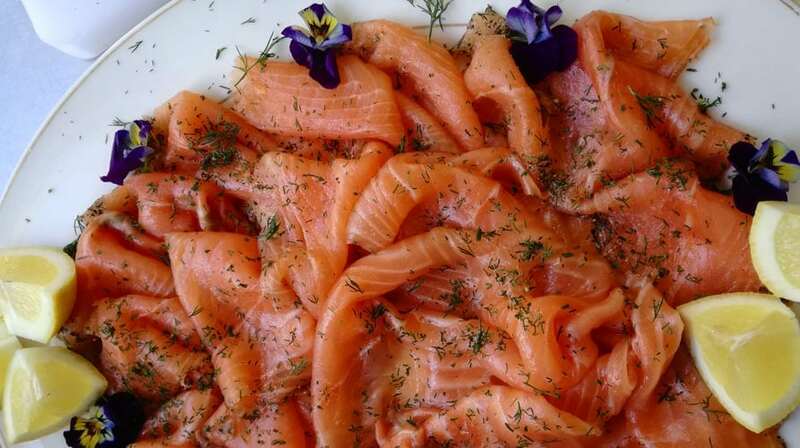 It’s simply fantastic fare – fresh, local, extravagant and filled with flavour, mainly vegetarian and fish, but with optional meat options sometimes also included. 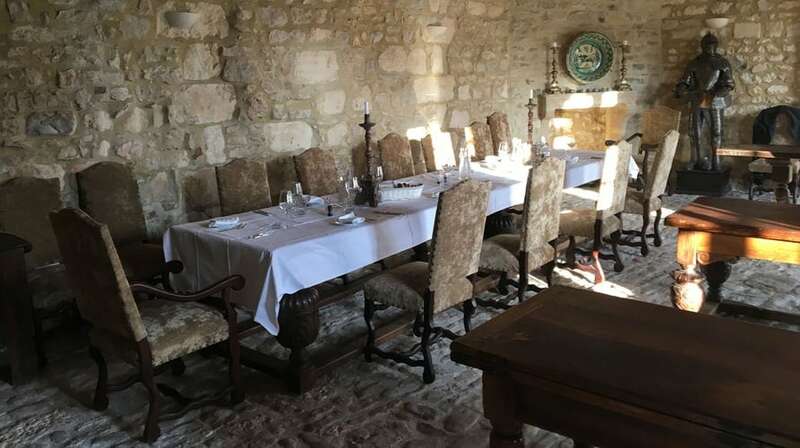 Wine is offered with lunches and suppers, and a pre-dinner aperitif encourages social interaction, though non-alcoholic alternatives are always at hand and you are perfectly free to refrain if you so choose. Although the food is on the healthier side, this isn’t a place to physically detox – your mind is doing that instead. Breakfast is an unfussy, serve yourself, communal affair hosted in the The Commons’ Medieval Dining room, complete with a knight in shining armour watching over the affair. Expect French press coffee, tea, green juice (such as kale/apple/lemon/ginger/parsley), detox water (distilled water with lemon/lime/mint/cucumber/ginger), mouthwatering croissants, chef-prepared granola, fruit, scrambled eggs with garden-picked herbs, local yogurt and honey and fresh juices all on offer. Lunch is eaten in the 19th Century House’s kitchen or outside on one the terraces if it is warm and sunny, and no two meals are ever the same – you might have vegetarian lasagne, seasonal vegetable and cheese tarts, Shakshuka (ratatouille with poached eggs), sweet potato and salmon roulades, beetroot humous, seasonal soups (gazpacho, butternut cumin coconut, etc. ), several varieties of salads and cheeses – you’ll also have access to a personal space inside the 19th Century kitchen’s refridgerator to save your favourites for later snacking. French-style aperétif is typically served in The Commons’ Medieval Dining Room, unless the warmth of the sunset is irresistible, in which case it is taken out on the main grounds terrace. Sip the local Cremant de Bourgogne or non- alcoholic cocktails and enjoy local cheeses (Epoisses, Chèvre, Brie de Meaux, Chaource), fresh baked Gougères, homemade sweet potato, turnip and beetroot crisps or smoked salmon tartlettes filled with surprising combinations. Later, dine in the The Commons’ Medieval Dining Room of expertly prepared dishes such as locally farmed organic trout, Monkfish with capres et olives, prawns in a Jamacian curry, grilled artichokes, roasted vegetables with polenta fritters, butternut squash raviolis in a sage sauce served with a warm chevre salad. Desserts are always included – enjoy indulgent salted caramel tart, chocolate mousse, profiteroles, seasonal fruits sorbets and meringues. On each retreat at least one participant is awarded a full grant from The Strategic Space to cover the expense to attend. 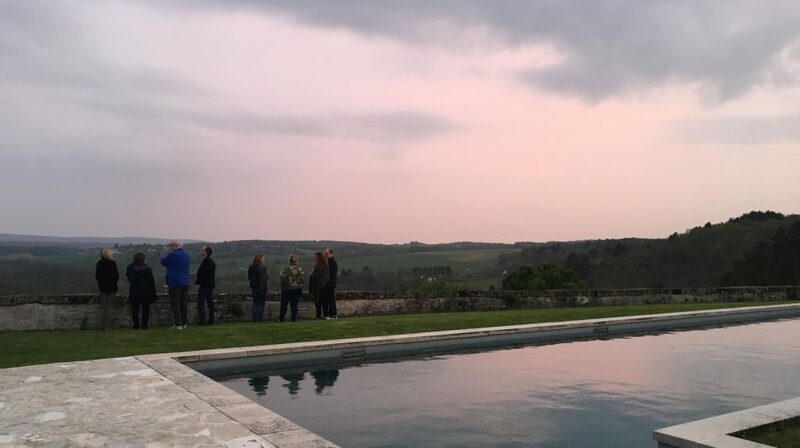 Many retreat participants contribute to an ongoing scholarship programme to help support the attendance of emerging creative visionaries who need financial support to attend future retreats. Further information can be found on the website. 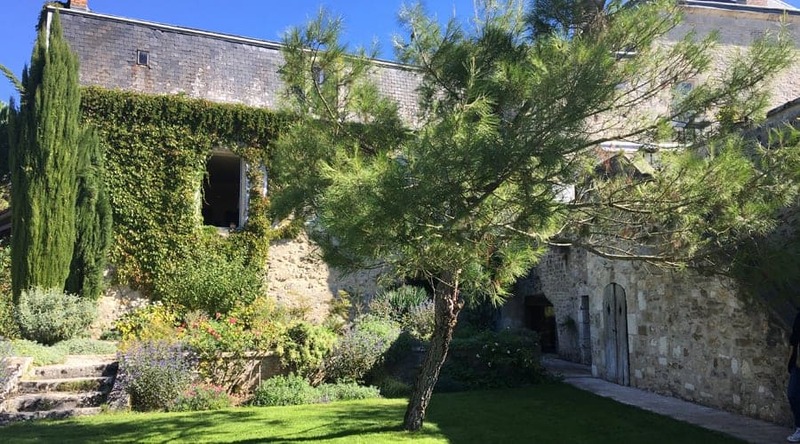 The chateau employs only local staff, from the local gardener who tends to the rooftop potager, the grounds keeper who builds the morning fire on the cliff’s edge terrace, and the local winemakers, cheesemongers and farmers who deliver the day’s bounty. The priority is to locally source ingredients and wine, and chef Ollie is militant about composting food waste. There are water stations with distilled water in glass carafes with drinking glasses available throughout to keep you hydrated and eliminate extra bottled waste. 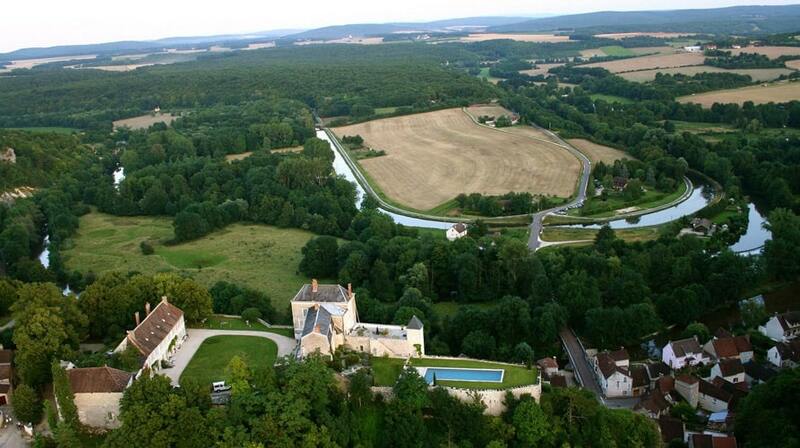 Le Chateau de Mailly, 5 rue du Chateau, 89660 Mailly le Chateau.